The Sun and everything else in our solar system is incredibly huge. When we look out into the night sky we can see hundreds of other stars outside of our solar system. All of these stars and our Sun are a tiny part of much larger systems called galaxies. A galaxy is a cluster of millions or billions of stars. Galaxies are the largest systems in the Universe. In fact, they are so large that we cannot measure them using normal systems of measurements like kilometers or miles. Instead we have to use light itself to measure the size of galaxies. Galaxies are measured using light years. A lightyear is the distance a beam of light will travel in one year. 1 lightyear = 5,865,696,000,000 miles!!!!! Galaxies are thousands of light years across, and hundreds of light years thick. The first galaxies outside our own were discovered by astronomer Edwin Hubble. Because of his incredible contributions to science we named the most powerful telescope ever after him. One of the first experiments undertaken using the Hubble Space Telescope was to peer into the farthest and darkest regions of space that we thought were empty. The image below is what came back. It is called the Hubble Deep Field Image. 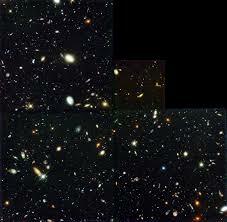 What we learned from the Hubble Deep Field Imagery is that the Universe is incredibly full! Each point of light in the Deep Field image looks like a single star, but is actually an entire galaxy containing billions of stars. Using the Hubble, and other space telescopes we have scanned about half of the visible Universe. Based on these initial searches we believe that there are around 100 billion galaxies, each made up of hundred of billions of stars!!! How do we Classify Galaxies? Most galaxies in the universe are spiral galaxies. Spiral galaxies have a central dense cluster of stars. The core is the brightest part of spiral galaxies because there are so many stars packed in that one space. Spiraling out from the core are several spiraling arms that revolve around the center. Elliptical galaxies are the second most common type of galaxy. Like spirals, elliptical galaxies have a dense, bright core, however they do no have arms spiraling off. As a result they have a plain elliptical shape. Irregular galaxies are smaller, less bright, and the least common of all galaxies. As their name implies, irregular galaxies do not have a definable regular shape. Instead they have random, irregular, and often interesting shapes. The irregular galaxy shown to the right is called the Hummingbird Galaxy after its bizare shape. The galaxy we belong to is called the Milky Way. It got this name because as viewed from Earth all of the stars in the galaxy create a generally milky lighter streak in the night’s sky. The Milky Way is a spiral galaxy about 140,000 light years in diameter. Its greatest thickness is about 20,000 light years at its center. The Sun is one of about 400 billion stars in the Milky Way, and is located about 23,000 light years from the center.